"From Suburb to Shtetl" is an outstanding ethnography that moves beyond simple demographics. Mayer weaves an intricate tapestry of how family, school, and community leaders influence each other. Whether discussing the role of the rebbe or the matchmaker, those who know these communities will find what he says as relevant today as it was when first penned. This is hardly surprising, for the ultra-Orthodox community takes great pride in not changing, in maintaining itself as it was in Europe despite the allure of modern American society. His discussion of synagogue life is particularly informative and evocative. Those in charge of helping immigrants adopted the path of least resistance, allowing and even encouraging them to retain their identities except for those few aspects that might threaten the country's national interests. The American Orthodox community was tremendously augmented by the arrival from Europe, after World War Two, of thousands of Orthodox Jews who remained devoted to that way of life. 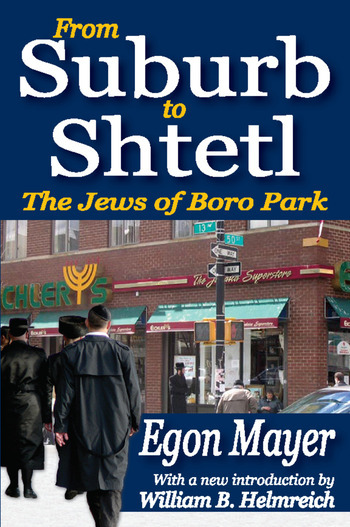 Egon Mayer was himself part of a smaller, but significant group of Jews who came to the U.S. and settled mostly in Boro Park in the wake of the 1956 Hungarian Revolution. The interaction between the Hasidim and their less fervent Orthodox counterparts described and analyzed in this volume tells us a great deal about how people negotiate their beliefs, values, and norms when forced into close contact with each other in an urban setting within the larger American culture. By exploring these and many other related issues Mayer has given us the chance to assess and forecast the future of American Jewish life as a whole.